Southern California Edison (or SCE Corp), the largest subsidiary of Edison International, is the primary electricity supply company for much of Southern California. It provides 14 million people with electricity across a service territory of approximately 50,000 square miles. However, the Los Angeles Department of Water and Power, San Diego Gas & Electric, Imperial Irrigation District, and some smaller municipal utilities serve substantial portions of the southern California territory. The northern part of the state is generally served by the Pacific Gas & Electric Company of San Francisco. Southern California Edison trucks lined up for delivery to help restore power in the wake of Hurricane Sandy, 2012. Southern California Edison (SCE) still owns all of its electrical transmission facilities and equipment, but the deregulation of California's electricity market in the late 1990s forced the company to sell many of its power plants, though some were probably sold by choice. In California, SCE retained only its hydroelectric plants, totaling about 1,200 MW, and its 75% share of the 2,150-MW San Onofre Nuclear Generating Station, which has been shut down since January 2012; in June 2013 the company announced its intention to permanently close and decommission the nuclear plant. Also, SCE still owns about half of the 1,580-MW coal-fired Mohave Generating Station in Laughlin, Nevada, which supplied electricity to California, Nevada, and Arizona; Mohave closed in December 2005, amid concerns regarding water rights and coal supplies. The utility lost all of its natural gas-fired plants, which provided most of its electrical generation. The large, aging plants were bought by out-of-state companies such as Mirant and Reliant Energy, which allegedly used them to manipulate the California energy market. The origins of the company lie with the grand scheme of magnate Henry E. Huntington and hydraulic engineer John S. Eastwood, developed around 1908, for a vast complex of reservoirs to be constructed in the Sierra Nevada Mountains of central California. Huntington founded Pacific Light and Power, one of the roughly two dozen companies he controlled at the time, to execute what would eventually become one of the largest hydropower systems in the United States, the Big Creek Hydroelectric Project. 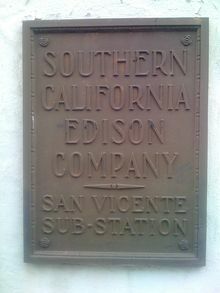 Pacific Light and Power was one of the predecessor companies to SCE, along with Edison Electric, Mt. Whitney Power & Electric Co., California Electric Power Co., Southern California Power Co., and others. In November, 2014, Southern California Edison announced a partnership with Ice Energy to provide more efficient energy storage by freezing water at night when electricity is cheaper. In 2015, Southern California Edison began laying off American information technology employees and replacing them with H-1B visa immigrants from India; the lay off of American employees affected 400 individuals, and was due to the utility hiring Infosys for its information technology needs. The layoffs were questioned by members of the United States Senate. Southern California Edison agreed to pay a $650,000 settlement for the 2011 blackout with FERC and NERC. On December 16, 2011, a shooting occurred when an employee of Southern California Edison opened fire at an office building in Irwindale. The employee killed two co-workers and seriously wounded two others before committing suicide. Southern California Edison allows its customer to obtain their electricity entirely from renewable sources by subscribing to a "green rate". In 2006, Southern California Edison planned to secure 1,500 megawatts or more of power generated from new projects to be built in the Tehachapi Pass Wind Farm area. The contract, which more than doubles SCE's wind energy portfolio, envisions more than 50 square miles (130 km2) of wind parks in the Tehachapi region, which is triple the size of any existing U.S. wind farm. In March 2008, Southern California Edison announced a $875 million project to build a network of 250 megawatts of photovoltaic solar power generation, making it the biggest solar cell project in the nation. The photovoltaic cells will cover 65,000,000 square feet (6,000,000 m2) of rooftops in southern California and will generate enough power to serve 162,000 homes. In 2009, Southern California Edison entered into a contract with Solar Millennium to purchase solar thermal power up to 726 MW. Southern California Edison also entered into a contract with Stirling Energy Systems to buy electricity from a 500 megawatt, 4,600 acre (19 km2), solar power plant which was due to open in 2009. The purchase was canceled in late 2010, as changes in technology reduced the cost of photovoltaic-based solar power to below that of solar Stirling generated power. This would have been the first commercial application of the dish stirling system. A different technology from the more familiar solar panel, the dish concentrates solar energy by the use of reflective surfaces and by the use of the Stirling heat engine to convert the heat into electricity. In 2014, Southern California Edison installed more than 600,000 lithium-ion battery cells at a substation in Tehachapi, California in order to test storing power generated from an area that currently has 5,000 wind turbines. In 2014 SCE had a renewables mix of 23%. By 2016, 28.2% of SCE's power sources were renewable. Southern California Edison has a number of resources and a rate designed specifically for electric vehicle users. As of July 2018, Southern California Edison plans to add thousands of new charging stations for passenger electric vehicles (EV). This addition is a component of the company's "Charge Ready" program, a pilot program with the aim of increasing the availability of charging ports for EVs. Since 2016, Southern California Edison has installed 1,000 charging stations throughout their Southern and Central California service area. The company also runs a rebate program for electric vehicle purchases. Southern California Edison gives people in its service area who purchase a new or used, or lease, an electric vehicle a $450 rebate. The program will run until 2020. Southern California Edison has a long history of research in the energy arena. Often this includes working with other companies and government entities. One example is the SOLARII feasibility generator, which was a solar-powered energy plant that could produce electricity 24 hours a day. This was done by heating molten salts that would hold the heat during the day and would be used to generate power at night. Dr. John Jurewitz served as Director of Regulatory Policy for Southern California Edison for 15 years until his retirement in July 2007. His major areas of research are in oil, gas, and electricity policy and greenhouse gas regulation. He has testified and participated in government-sponsored proceedings addressing electric industry restructuring and energy policy at the state, federal, and international levels. In April 2015, Southern California Edison laid off about 400 IT employees, with an additional 100 IT workers leaving voluntarily. Meanwhile, the utility company hired Infosys, based in Bangalore, and Tata Consultancy Services in Mumbai, which are among the largest users of H-1B visas. About 70% of the work to be done by Tata and Infosys will be completed offshore, according to SCE. The company claimed it had to lay off US-based employees to stay competitive. SCE was subsequently investigated by the US Department of Labor for potential H1-B visa abuse. In October, Department of Labor concluded Infosys did not abuse the H1-B program in the dealings with SCE, while Tata's case remained open. ^ "Southern California Edison Announces Plans to Retire San Onofre Nuclear Generating Station". Edison International press release. June 7, 2013. Archived from the original on 12 June 2013. Retrieved 10 June 2013. ^ "Summary of FERC documentation relating to the Western Energy Crisis 2000-2001". Retrieved 2013-06-10. ^ Staff, "Historic Redlands Lighting System Today 50 Years Old - Street Illumination Proved Feasibility Of World's First Long Transmission Line", The San Bernardino Daily Sun, San Bernardino, California, Friday 6 August 1943, Volume 49, page 12. ^ "Southern California Edison Photographs and Negatives". hdl.huntington.org. Retrieved 10 April 2018. ^ Richardson, Jake. "25 MW Of Ice Energy Storage For Southern California Edison". Clean Technica. Sustainable Enterprises Media, Inc. Retrieved 30 December 2014. ^ Thibodeau, Patrick (4 February 2015). "Southern California Edison IT workers 'beyond furious' over H-1B replacements". Computer World. Retrieved 3 April 2015. Li, Shan; Morrison, Matt (10 February 2015). "Edison's plans to cut jobs, hire foreign workers is assailed". Los Angeles Times. Retrieved 3 April 2015. ^ Kopetman, Roxana (17 March 2015). "Senators question Southern California Edison's layoffs, replacement with Indian workers". Orange County Register. Retrieved 3 April 2015. ^ "FERC Approves Third Settlement in 2011 Southwest Blackout Case". FERC. ^ "Green Rate - Standard Residential Rate Plan". www.sce.com. ^ "Southern California Edison Signs Largest Wind Energy Contract in U.S. Renewable Industry History". edison.com. Archived from the original on 1 January 2007. Retrieved 10 April 2018. ^ "Southern California Edison Launches Nation's Largest Solar Panel Installation". Edison International. March 27, 2008. Retrieved 2011-03-08. ^ "Solar Millennium and Southern California Edison signed power purchase agreements". Solar Millennium. July 17, 2009. Retrieved 2011-03-08. ^ Sterling D. Allan (August 11, 2005). "World's largest solar installation to use Stirling engine technology". Pure Energy Systems. Retrieved 2011-03-08. ^ Michael Kanellos (March 12, 2007). "Full steam ahead for Nevada solar project". ZDNet. Retrieved 2011-03-08. ^ Michael Kanellos (December 23, 2010). "More Bad News for Stirling: So. Cal. Edison Cancels Power Purchase Agreement". GreenTech. ^ McFerron, Whitney (October 13, 2014). "Giant Battery Unit Aims at Wind Storage Holy Grail: Commodities". BloombergBusiness. ^ Tarantola, Andrew (20 December 2017). "California is set to hit its green-energy goals a decade early". Engadget. Retrieved 27 December 2017. ^ Brandt, Jaclyn (2018-07-02). "Southern California Edison pushes for major expansion of EV charging station infrastructure". Daily Energy Insider. Retrieved 2018-07-04. ^ "Southern California Edison offers $1000 credit to any EV/PHEV drivers". Electrek. 2017-05-22. Retrieved 2018-11-28. ^ Lutz Mez, Mycle Schneider and Steve Thomas (Eds.) (2009). International Perspectives of Energy Policy and the Role of Nuclear Power, Multi-Science Publishing Co. Ltd, p. 591. ^ Faruqui, Ahmad; Eakin, Kelly (30 September 2002). "Electricity Pricing in Transition". Springer Science & Business Media. Retrieved 10 April 2018 – via Google Books. ^ "Edison's plans to cut jobs, hire foreign workers is assailed". Los Angeles Times. Los Angeles Times. Retrieved 14 December 2015. ^ "Southern California Edison IT workers 'beyond furious' over H-1B replacements". ComputerWorld. ComputerWorld. Retrieved 14 December 2015. ^ "Feds investigating Southern California Edison contractors after allegations of work visa abuse". scpr.org. Retrieved 14 December 2015. ^ "Feds find no wrongdoing by firm that provided foreign workers to Edison". scpr.org. Retrieved 14 December 2015.